Yvonne is Course Administrator with responsibility for marketing. She also coordinates our volunteer helpers. She worked in various roles around Sobell House for six years, including Ward Reception, prior to this role, and has been based in the education department for 20 years. 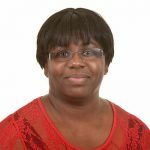 Yvonne works with the Clinical Lead and Education Lead on the collaboration and bespoke courses and The Oxford Advanced Course programme. Yvonne takes pride in providing a high level of service leading to a high quality customer experience.